Another ingenious invention by Google, when will it end! Fortunately not anytime soon. Google drive acts like an external drive where folders of all documents and media can be kept on the web and on your computer or any mobile device. You can access Google Drive and edit presentations, documents, set up events and share this information and have others comment on it while you’re busy. You can include media such as videos, photos, PDFs and your Google Docs to Google Drive. 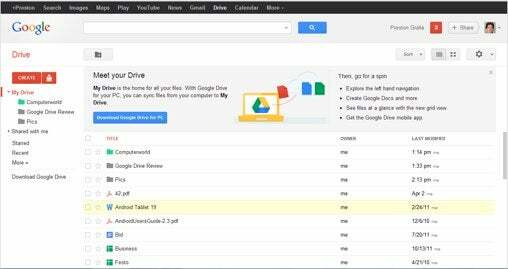 Install Google Drive and a folder will be created, which syncs with your pc. https://drive.google.com/#my-drive is the site which takes you to ‘My Drive’ – this is the Mecca of all your files. Whatever you throw into the file on your desktop or on your tablet or mobile phone it will pop up in ‘My Drive’. You can toggle between using your documents online and offline. Online you can access it through the site while offline lets you access your documents as you normally would via a folder. You can do more than just store a bunch of text, Google Drive is interactive. With Google Drive you can work with others online in real time and have them edit and comment while you work. It is also very easily accessible from the home, office, a MAC or a PC, any mobile device and tablet or simply logging in via drive.google.com. It’s stored safely and has 5 GB free for a range of file sizes. If your computer crashes don’t fret because everything stored in the Google Drive folder will be stored digitally on Google. For those who make use of most Google programmes Google Drive seeks to incorporate all those experiences by allowing one to attach photos from the drive to Google Plus posts. This programme also has the stealthiest search function ever! You can filter searches for user names or file types when using the conventional keyword search. The nifty Optical Character Recognition also allows you to find texts in scanned documents such as old newspaper articles, photo labels and more. Google Drive is still in its beginning stages, but we can only see it getting better. The busy Google bees are working on allowing users to attach documents from Drive onto Google e-mails.